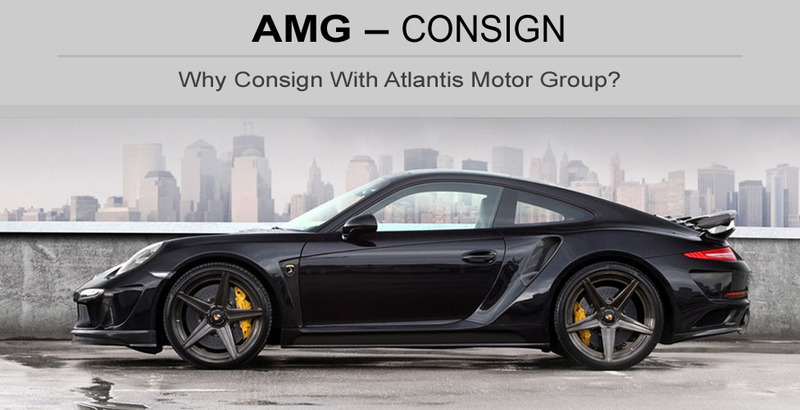 Why Consign With Atlantis Motor Group? You can’t sell your car if nobody sees it! At Atlantis Motor Group, we take the marketing of your vehicle very seriously. We have a huge following of car enthusiasts and collectors from all over the world who regularly peruse our inventory. In addition to listing your vehicle on our website's inventory and on eBay motors, your car will be listed on multiple sales websites and social media for maximum exposure. Additionally, we send out weekly email marketing campaigns to thousands of followers. The sales of vehicles overseas is also a tremendous market for Atlantis Motor Group as we have relationships from Europe to Dubai and other countries worldwide. We realize you have a choice in who you trust to sell your vehicle. At Atlantis Motor Group, building long term relationships with our clients is our top priority. Please call our helpful staff at 800-935-9590 with any questions. The process of consigning your vehicle with Atlantis Motor Group is a simple one. We are known for dealing in Exotic, Luxury, Classic, Muscle and Race Cars of the highest caliber and the cars we take in on consignment must meet our standards. In order to offer a car for sale at Atlantis Motor Group, it must be in pristine condition. To ensure this, each vehicle undergoes a thorough inspection and detailing process, noting any reconditioning and or service that must be performed in order for the vehicle to meet our standards. Once we agree on a fair market price of your vehicle, we will enter a consignment agreement with the expectation that your vehicle will be sold within 30 to 90 days. Please call 800-935-9590 with any questions. AMG will perform the initial extensive detail, photo session, ad creation and other miscellaneous services needed to your vehicle, AMG will then list your vehicle on eBay and multiple other websites and social media and our weekly email marketing campaigns. It becomes a low cost way to have your car professionally reconditioned, marketed and SOLD !!! Your vehicle will go through the same rigorous inspection and detailing process as the vehicles in our inventory. Your vehicle may require some reconditioning or service at additional expense to meet our standards. These services are performed by our highly skilled technicians specializing in scratch and dent removal, paintwork, wheel repair, high speed buffing, wet sanding, extensive detailing, and service. Please call 800-935-9590 with any questions. Most people are unaware that they receive a tax credit when they trade in or sell a car to a dealership. This also applies to a consignment car. Once your vehicle is sold, the tax credit will be applied toward another vehicle purchased from Atlantis Motor Group. Please call 800-935-9590 with any questions. We will guarantee a sale on your vehicle. If your vehicle does not sell within 90 days at the agreed price, Atlantis Motor Group will guarantee to buy your vehicle at fair market value at that time. Terms and conditions apply. Each consignment agreement can be tailored to fit your needs. Please call 800-935-9590 with any questions. Out of state? We will pick up your vehicle ! We are willing to make an investment in this transaction to earn your business. If you are out of state, we will arrange nationwide shipping for your vehicle from you to us at our expense. This dollar amount will come out of the net proceeds at the time of sale. We will make this process as easy and convenient as possible. Please call 800-935-9590 with any questions. Thank you! Your consignment form has been submitted. We will get back to you soon!